After reminiscing about a summer trip to the Greek island of Santorini, jewelry designer Angela Arno became inspired to create her last collection, aptly titled "Santorini:"
"The Santorini collection features lapis lazuli, freshwater pearls, and lots of 14K gold-filled chain and accents. Some key shapes for 2006 include the long Y necklace and delicate gemstone drops of chrysoprase and iolite. Warm-hued tortoise glass, deep orange mandarin garnet, and citrine evoke memories of the famous Oia sunsets, while lava and glass are nods to the volcano that gave Santorini its striking natural characteristics. 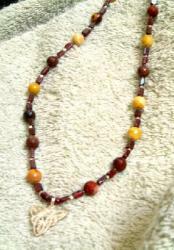 "I didn't do the obvious thing and work with leather and Greek ceramic beads. I wanted to interpret the island and Greek culture through my jewelry in a different way," said angela. This new collection, recently shown to the trade at Accessories: The Show in NYC, is now available online at www.angelaarno.com and at select retail locations. As a result of designer Angela Arno's continuing creativity, new pieces are constantly being added to the collection. Samples and images available for print and other media upon request." Entering is easy – just sign up for The Jewelry Weblog weekly newsletter. That's it. Already signed up for it? Excellent, then that means you've already entered to the contest! How to you sign up? Again – easy peasy – scroll down and on the right of the screen, you'll see an icon that says " Subscribe." Above this, you'll see an empty box. Just type in your email address, click on the " Subscribe" icon underneath, and voila! You'll be entered automatically into the drawing, and you'll also start to receive our weekly newsletter that will give you the latest and greatest news from The Jewelry Weblog. The contest will run from now until January 31, 2006 midnight est. The winner will be notified by email within 10 days of the final date of the drawing, and the winner will have 10 days after notification to reply in order to receive the prize. Creative Weblogs (and that includes me) will not be responsible for any "lost" emails or technical problems that may occur. 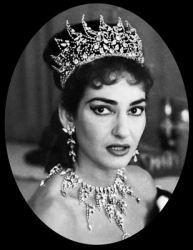 "Swarovski acquired the Atelier Marangoni in 1999 and prevented the collection of Maria Callas's stage jewelry from being dispersed all around the world. After years of restoration work the spotlight is once more shining on these masterpieces, some of which are more than 50 years old. The exhibition has so far had more than 2.2 million visitors. After Vienna it will travel to Florence and then to Salzburg, Berlin, London, Tokyo and New York." Here's a look at some of the pieces for those of us who live in no-where-ville. Finalfashion believes that runways are no longer the only venue for selling fashion items and suggests the trunk show as an option. We jewelry lovers have known about trunk shows now for a good while, and I've even reported not too long ago about the trend of virtual trunk shows. Great minds think alike – Fashionable Kiffen was actually much more articulate than I was but we have the same message: "The print media will always be important and relevant to fashion – the editorials, the stories, and the advertising vehicles are all important to the industry. But the machine has started to operate differently." Andrea Tung shows another niche area to fashion in her post "The iKnit Generation." She suggests that mass production is out and hand-crafting is in. For those us who appreciate hand-crafted jewelry, her thoughts resonate: "Ever since we went digital, everything has been digital, nothing is "real" anymore, no longer tangible in your hands except stuck inside a glowing box. Crafting in general has been also receiving a major comeback. [...] Domesticity is in. That's right, after a generation of feminist messages about sharing the housework, we can say being domestic is in." These are just a few posts that stood out to me and I thought worth sharing. Of course, if you want a full run-down on "The State of the Fashion Union," you can find it on Almost Girl and Fashiontribes. Both these blogs are coordinating this weblog carnival. One more note – I've actually been amazed at the diversity of blogs related to fashion. It just proves the point I was making in my post "Jewelry Fashion Coming of Age on Line" – there's way more to fashion than a tall, skinny girl walking down a runway in a dress looking bored.
" In keeping with antique diamond cuts, vintage-inspired designs continue to drive engagement ring fashion trends. Everyone still remembers Madonna's beautiful Edwardian-style engagement ring, with its classic hand-engraved scroll work. One vintage style that is extremely popular this wedding season is the filigree engagement ring. Filigree is the ornamental work of fine gold or platinum that's carefully crafted into an openwork design. It's an art form that can be traced all the way back to 3rd century Greek jewelry. During the 1930s, platinum and 18K white gold filigree engagement rings were among the most sought after rings in both America and Europe. Today's jewelry designers have brought back the romanticism of this age-old art, taking elegance and sophistication to a whole new level. Enhanced with geometric patterns, floral cutwork, and milgrained edges (which lend the appearance of fine antique embroidery), these new filigree rings capture the breezy elegance and femininity so often found in today's young brides." "Ornate brooches create visual interest, volume and soft curves on the backs of full skirts. Beading and Swarovski crystals sewn into gowns are usually a subtly different color than the gown, such as light crystal blue, pale rose, golden pearl or silver. Many brides are choosing an ornamental headpiece with no veil. 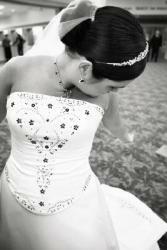 Beaded and jeweled headbands or hair combs are popular among brides who want a look more subtle than a tiara. "A bare neck, big earring effect is popular," Rager says. Those who choose necklaces are often picking jewels in shades of peach and pink rather than the traditional pearl or diamond-style rhinestones. " Accessories have historically taken the back seat when it comes to their inclusion in the world of fashion. However, I believe this is starting to change. More and more attention has begun to evolve around jewelry, hand bags, shoes, and other accessories, and much of this new sway in fashion reporting is due to the Internet. As an accessories lover, especially when it comes to jewelry of course, I'm excited to see this new trend in fashion reporting, but I'm still not satisfied. In fact, I think it is way past time for the off-line media to catch up to us. For example, I'd love to see a magazine about accessories for the masses instead of only industry periodicals for those who are "in the business," as they say. Another neat idea would be Project Runway type show for jewelry designers or hand bags designers. What about you? What do you think it will take for off-line media to catch up to the rest of us? (This post is part of the "The State of the Fashion Union" – Find out the details at Almost Girl). I thought these were pretty clever. If you've ever seen anyone work with hot glass, these are probably pretty easy to put together. 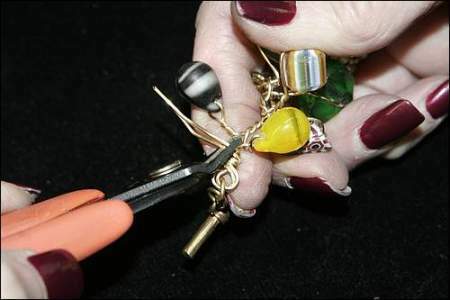 So far, this is the first I've seen of anyone using hot glass to make glass ribbon pendants. They have a ton of different colored ones on their site at http://www.mymuranojewelry.com/ .
" Each Art glass ribbon pendant from the same ribbon color collection will vary slightly and no one piece will ever be exactly like another… it's like wearing a piece of custom jewelry… Unique, different and ONE OF A KIND; just like YOU. Each ribbon pendant is about 1 1/8" tall, and has a glass bail that will accommodate a ribbon, rubber cord or chain." 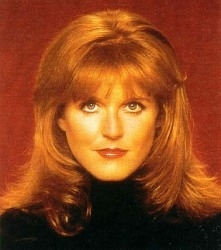 " Sarah Ferguson, The Duchess of York, has signed an exclusive Jewelry Licensing Agreement with K&G Creations. The Duchess will partner with K&G Creations to create a collection of unique jewelry designs featuring Charles & Colvard(TM) created Moissanite. K&G Creations is the world's largest manufacturer of moissanite jewelry. The initial signature collection will debut in the 2nd Quarter of 2006, with additional collections to follow. The vintage inspired collection, "Sarah Ferguson for K&G Creations," will consist of rings, necklaces, earrings and bracelets set with Charles & Colvard(TM) created Moissanite. All of the Duchess' net proceeds from the K&G collection will be given to the "Sarah Ferguson Foundation for Children" which benefits the lives of children worldwide. The Duchess commented, "I'm excited about Moissanite, because it means that every woman can now own the jewelry of their dreams. K&G Creations' reputation for the highest quality in fine jewelry presents a wonderful opportunity to collaborate in bringing this exquisite jewel to all women." Moissanite is a unique, near colorless lab-created jewel with fire & brilliance unmatched by any other jewel or gemstone. Harder than sapphire or ruby and second in hardness only to diamond, Moissanite was first discovered in nature by French Nobel prize winner Dr. Henri Moissan in 1893. Women around the world have embraced this magnificent jewel and are rewarding themselves with the big, bold look of Moissanite jewelry." Is this just too weird? Or am I just so out of it that I can't imagine how jewelry in the mouth is supposed to be attractive? From " Grill lets you put your money where your mouth is:"
Paul Wall has mastered the art of conspicuous consumption, and his favored medium is his mouth. Thus, if the Houston rapper has pearly whites, we wouldn't know: Wall never appears in public without wearing a grill — a removable cosmetic mouthpiece made of gold or platinum with diamond inlays. Wall is flashing one such designer dental piece, also known as a front, on the cover of his 2005 album, "The Peoples Champ," which is loaded with references to bejeweled bicuspids ("Say cheese and show my fronts/ It's more carats than Bugs Bunny's lunch"). His jewelry box of a mouth is also open for public viewing in the video for Nelly's smash hit "Grillz," an ode to oral ostentation.